3 3 Consultant s obligations hereunder and (ii) cause said personnel, representatives and consultants to agree to be bound by the terms of this Agreement by executing a confidentiality agreement containing the same restrictions contained herein or some other method acceptable to Pace. Consultant agrees to protect the confidentiality of the Confidential Information in the same manner that it protects the confidentiality of its own proprietary and confidential information of like kind, but in no event less than reasonable means. Consultant agrees to notify Pace of any unauthorized use or disclosure of Confidential Information and to take all actions reasonably necessary to prevent further unauthorized use or disclosure thereof. These requirements apply to any subcontractors or agents Consultant uses in the performance of the Work and it is Consultant s responsibility to assure that all such subcontractors and agents comply with all such requirements. The terms of this Section 8 shall survive the expiration or termination of this Agreement. 9. Assignment. Consultant shall not assign its duties hereunder without the prior written consent of Pace. 10. Binding Effect. This Agreement shall be binding upon the parties hereto and upon their respective successors and assigns. 11. Compliance With Laws. 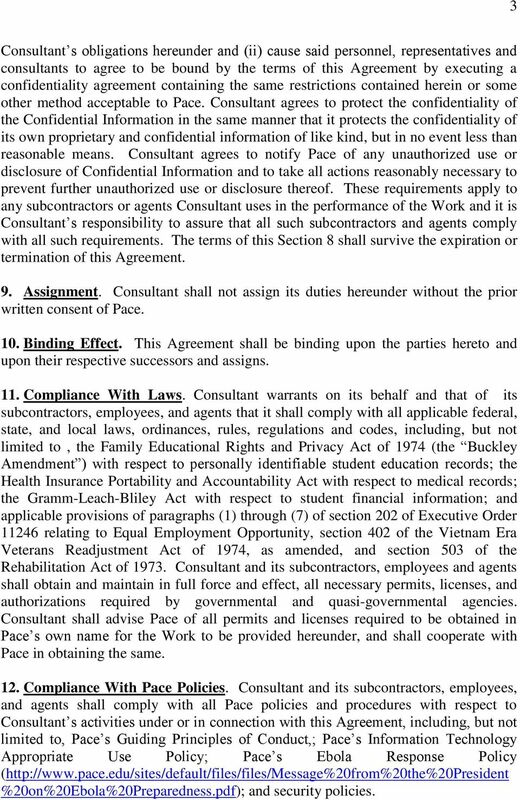 Consultant warrants on its behalf and that of its subcontractors, employees, and agents that it shall comply with all applicable federal, state, and local laws, ordinances, rules, regulations and codes, including, but not limited to, the Family Educational Rights and Privacy Act of 1974 (the Buckley Amendment ) with respect to personally identifiable student education records; the Health Insurance Portability and Accountability Act with respect to medical records; the Gramm-Leach-Bliley Act with respect to student financial information; and applicable provisions of paragraphs (1) through (7) of section 202 of Executive Order relating to Equal Employment Opportunity, section 402 of the Vietnam Era Veterans Readjustment Act of 1974, as amended, and section 503 of the Rehabilitation Act of Consultant and its subcontractors, employees and agents shall obtain and maintain in full force and effect, all necessary permits, licenses, and authorizations required by governmental and quasi-governmental agencies. Consultant shall advise Pace of all permits and licenses required to be obtained in Pace s own name for the Work to be provided hereunder, and shall cooperate with Pace in obtaining the same. 12. Compliance With Pace Policies. 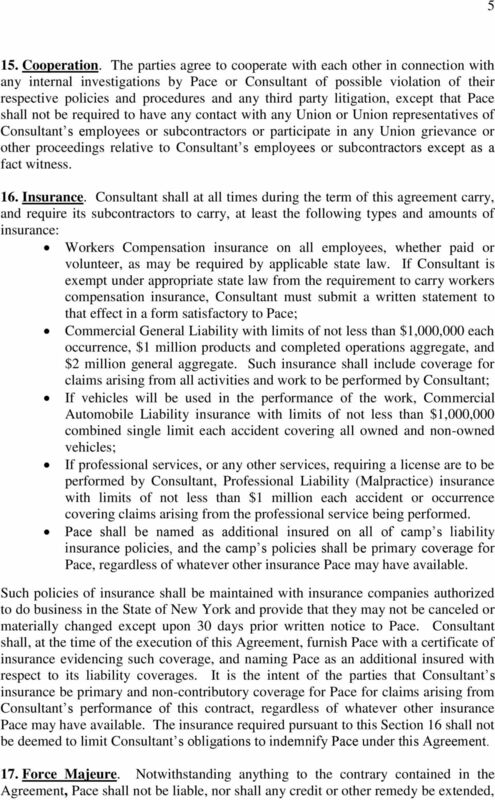 Consultant and its subcontractors, employees, and agents shall comply with all Pace policies and procedures with respect to Consultant s activities under or in connection with this Agreement, including, but not limited to, Pace s Guiding Principles of Conduct,; Pace s Information Technology Appropriate Use Policy; Pace s Ebola Response Policy ( %20on%20Ebola%20Preparedness.pdf); and security policies. 4 4 13. Proprietary Rights. Consultant hereby acknowledges and agrees that Pace has specially commissioned the Work as a work made for hire under Section 101 of the United States Copyright Act of 1976, as amended (the Copyright Act ). 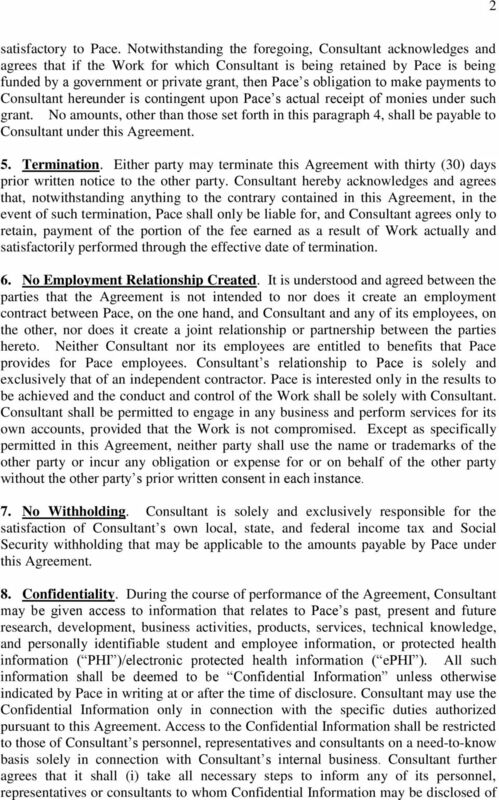 Accordingly, all intellectual property developed by Consultant for Pace in connection with this Agreement, including but not limited to all monitoring, testing and other data, reports, materials, schematic drawings, illustrations, trademarks, trade names, slogans, logos or other designs in any form, whether electronic, print or any other format, shall be owned solely and exclusively by Pace. 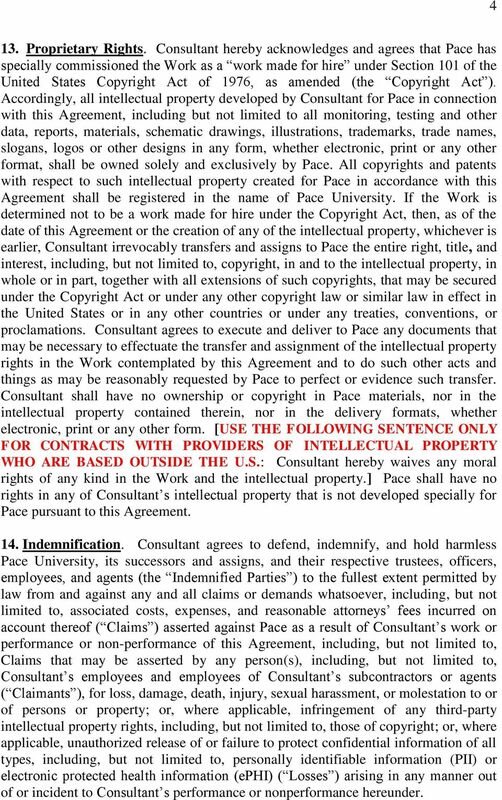 All copyrights and patents with respect to such intellectual property created for Pace in accordance with this Agreement shall be registered in the name of Pace University. If the Work is determined not to be a work made for hire under the Copyright Act, then, as of the date of this Agreement or the creation of any of the intellectual property, whichever is earlier, Consultant irrevocably transfers and assigns to Pace the entire right, title, and interest, including, but not limited to, copyright, in and to the intellectual property, in whole or in part, together with all extensions of such copyrights, that may be secured under the Copyright Act or under any other copyright law or similar law in effect in the United States or in any other countries or under any treaties, conventions, or proclamations. 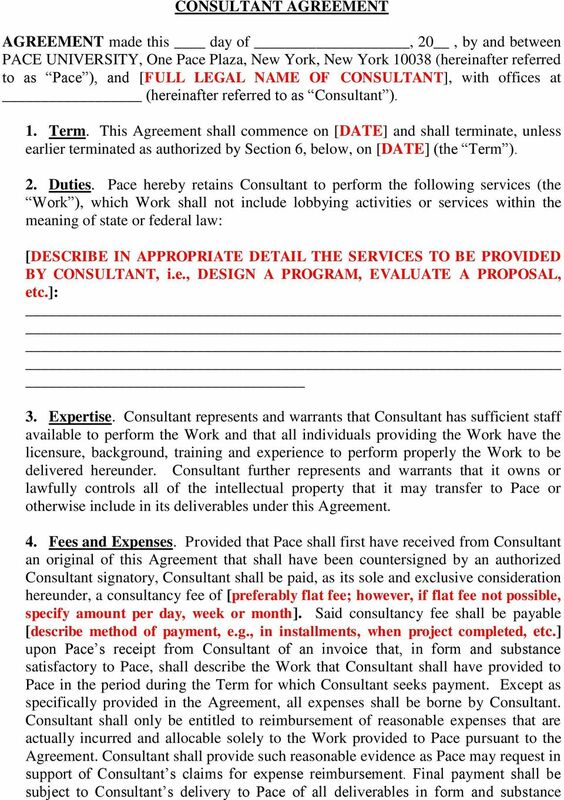 Consultant agrees to execute and deliver to Pace any documents that may be necessary to effectuate the transfer and assignment of the intellectual property rights in the Work contemplated by this Agreement and to do such other acts and things as may be reasonably requested by Pace to perfect or evidence such transfer. Consultant shall have no ownership or copyright in Pace materials, nor in the intellectual property contained therein, nor in the delivery formats, whether electronic, print or any other form. [USE THE FOLLOWING SENTENCE ONLY FOR CONTRACTS WITH PROVIDERS OF INTELLECTUAL PROPERTY WHO ARE BASED OUTSIDE THE U.S.: Consultant hereby waives any moral rights of any kind in the Work and the intellectual property.] Pace shall have no rights in any of Consultant s intellectual property that is not developed specially for Pace pursuant to this Agreement. 14. Indemnification. Consultant agrees to defend, indemnify, and hold harmless Pace University, its successors and assigns, and their respective trustees, officers, employees, and agents (the Indemnified Parties ) to the fullest extent permitted by law from and against any and all claims or demands whatsoever, including, but not limited to, associated costs, expenses, and reasonable attorneys fees incurred on account thereof ( Claims ) asserted against Pace as a result of Consultant s work or performance or non-performance of this Agreement, including, but not limited to, Claims that may be asserted by any person(s), including, but not limited to, Consultant s employees and employees of Consultant s subcontractors or agents ( Claimants ), for loss, damage, death, injury, sexual harassment, or molestation to or of persons or property; or, where applicable, infringement of any third-party intellectual property rights, including, but not limited to, those of copyright; or, where applicable, unauthorized release of or failure to protect confidential information of all types, including, but not limited to, personally identifiable information (PII) or electronic protected health information (ephi) ( Losses ) arising in any manner out of or incident to Consultant s performance or nonperformance hereunder. 6 6 for Pace s failure, in whole or in part, to fulfill its obligations under the Agreement where such failure arises from or in connection with causes beyond Pace s control, including, but not limited to, acts of God, flood, extreme weather, fire or other natural calamity, terrorist attack, any law, order, or regulation or action of any governmental entity or civil or military authority, power or utility failure, cable cuts, unavailability of rights-of-way, national emergencies, riots, wars, strikes, lock-outs, work stoppages, or other labor difficulties (each a Force Majeure Event ). If a Force Majeure Event occurs during the term hereof, Pace shall be excused from performance hereunder. 18. Governing Law and Jurisdiction. Except as may be preempted by federal law, this Agreement shall be governed by the laws of the State of New York, without regard to its choice of law principles. Litigation of all disputes between the parties arising from or in connection with this Agreement shall be conducted in a court of appropriate jurisdiction in the State of New York, County of New York. 19. Notices. 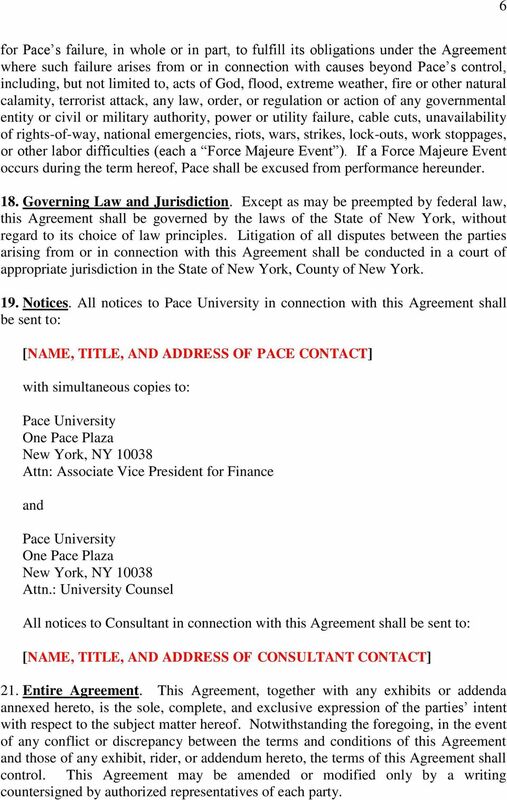 All notices to Pace University in connection with this Agreement shall be sent to: [NAME, TITLE, AND ADDRESS OF PACE CONTACT] with simultaneous copies to: Pace University One Pace Plaza New York, NY Attn: Associate Vice President for Finance and Pace University One Pace Plaza New York, NY Attn. : University Counsel All notices to Consultant in connection with this Agreement shall be sent to: [NAME, TITLE, AND ADDRESS OF CONSULTANT CONTACT] 21. Entire Agreement. 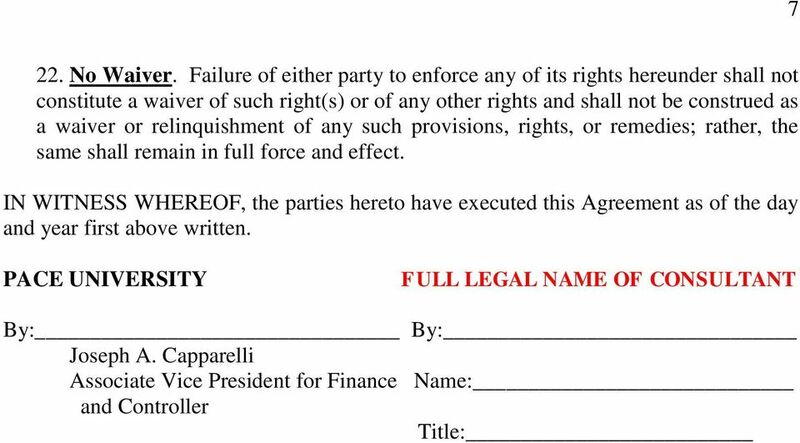 This Agreement, together with any exhibits or addenda annexed hereto, is the sole, complete, and exclusive expression of the parties intent with respect to the subject matter hereof. Notwithstanding the foregoing, in the event of any conflict or discrepancy between the terms and conditions of this Agreement and those of any exhibit, rider, or addendum hereto, the terms of this Agreement shall control. This Agreement may be amended or modified only by a writing countersigned by authorized representatives of each party. Columbia University Agreement Agreement ( Agreement ) dated as of, 20 (the Effective Date ) between The Trustees of Columbia University in the City of New York ( Columbia ) and ( Service Provider ). 1. Columbia University Marketing Agreement Agreement ( Agreement ) dated as of, 20 (the Effective Date ) between The Trustees of Columbia University in the City of New York ( Columbia ) and ( ). 1. Statement. PHOTOGRAPHY/VIDEO SERVICES AGREEMENT This Agreement is entered into as of the day of, 201_, between, Villanova University ( Villanova ) and, ( Photographer ). 1. Services. (a) Description and Requirements.